@turtle_head tweeted me a link the other day to possibly one of the simplest user interfaces I've ever seen. 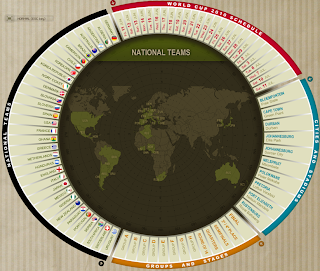 Based on the concept of sundial calendars, the Mundial 2010 from MARCA.com is the easiest calendar tool ever. Pictured here, the dial is a Flash-based calendar of upcoming South African World Cup soccer games. Roll over any one of the elements on the outer ring and all related information gets highlighted. Pick a country and see when they are playing, against whom and where. Pick a date and see all the times, competitors and locations of matches happening that day without ever leaving the dial. Totally easy to figure out: everyone I sent this to was able to understand within seconds what it is and how it works. Phenomenal. When's the last time you were able to say that about an app or a website? Your app or your website?